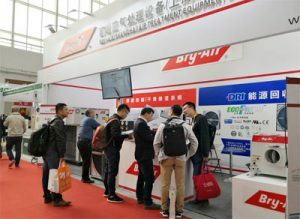 Bry-Air Shanghai Air Treatment Equipment Co. (Bry-Air China), a subsidiary of Bry-Air (Asia) recently showcased its product range at China’s biggest HVACR show “China Refrigeration 2018” at Shanghai, China from 9-11 April 2018. Various specialised equipment like Compact Dehumidifiers-FFB Series, Desiccant Dehumidifiers-FLC Series and Heat Recovery Wheel were displayed at the booth. Bry-Air China team at the booth welcomed the visitors from different countries & region like US, Hong Kong, Singapore, UAE at the booth. Several leading consultants, contractors in the region visited the booth and interacted with our Airgineers on the latest trends in Dehumidification and energy recovery. Bry-Air China has been a regular exhibitor at the show for more than a decade now.